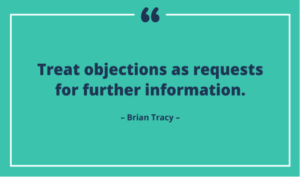 When handling customer objections, sales professionals must learn to shift their mindset from treating a “no” answer to a sales proposal as a personal rejection to recognizing it as an opportunity to learn more about the company and the challenges it faces. Reframing your mindset in this way is crucial to your success as a sales professional as it allows you to dig deeper into your customer’s mind in order to reveal positive alternatives and solutions. Too often sales professionals equate a “no” with a “not you” answer. In fact, there may be many reasons why the customer is saying no. 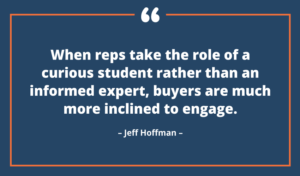 Your job as a sales professional is to actively listen. Take the time to mentally review the conversation and be curious about the information you learned in the meeting. Reviewing the conversation in this way will help you to prepare for a follow-up conversation. Actively listening to customers and mentally reviewing their responses will help you to generate more questions which will provide additional information on the challenge. Actively listening and mentally reviewing customer responses is a crucial aspect of handling customer objections that allows you to gain insights into problems the potential buyer is facing. Asking open-ended questions and listening carefully to the response is one of the most effective tools used by successful salespeople when handling customer objections. The average sales rep will listen to the story politely and then go into their sales pitch. Pay attention to keywords and themes within the customer’s story and become curious for more information. Open-ended questions will help you to gain more insight. Open-ended questions are questions that allow more information to come forward. Open-ended questions can also move the momentum of the conversation along smoothly and into next-steps. With additional information comes additional insights as to how the product or service can address the specific needs of the customer. How would you see the ideal tracking software working in your facility? What specific requirements do you have for tracking software? By allowing the customer the time to talk about more information and listening carefully, you have a more complete picture of the problem, which allows you then to provide a more specific description of how your software can solve those gaps and issues. Learning aspects of handling customer objections in sales conditions sales professionals to not take rejection at a personal level. It is one of the most effective tools for any sales rep. Letting those negative messages build up in the mind creates limiting thoughts about sales effectiveness in the future. Staying in this negative mindset will inhibit you from handling future customer objections effectively. Evaluate the meeting and note areas of increased knowledge about the buyer or company. A helpful and positive way of handling customer objections is getting into the habit of noting areas of agreement and understanding during the conversation. Shifting your sales mindset in this way will help you to form the stepping stones for the next meeting and future client interactions.